The School curriculum is presented through a variety of learning modules such as lectures, seminars, training, discussions, field trips, film screenings and social events. 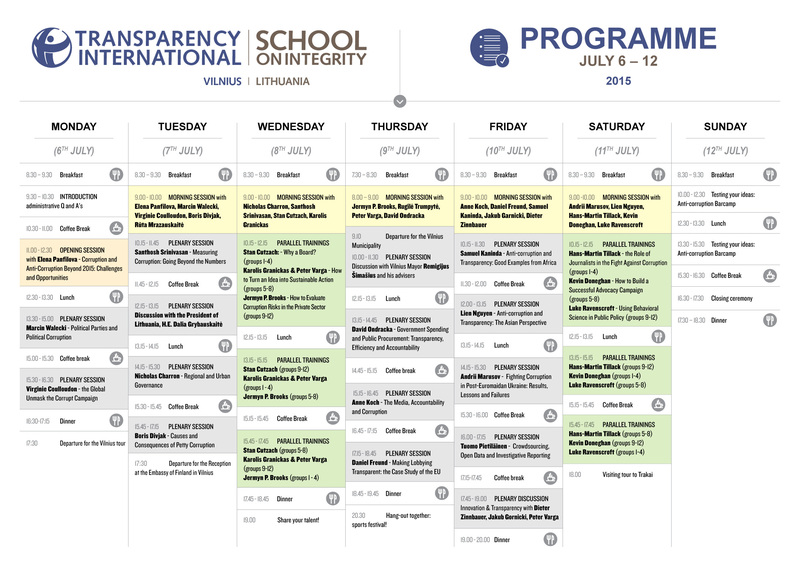 The program follows a conscious schedule which, as the week goes by, gradually moves away from introductory topics and toward seminars and training aimed to address particular subjects and lets participants acquire new skills. In short, the aim of the programme is to leave you inspired and empowered by creating opportunities to learn in small groups as well as through mentoring hours. 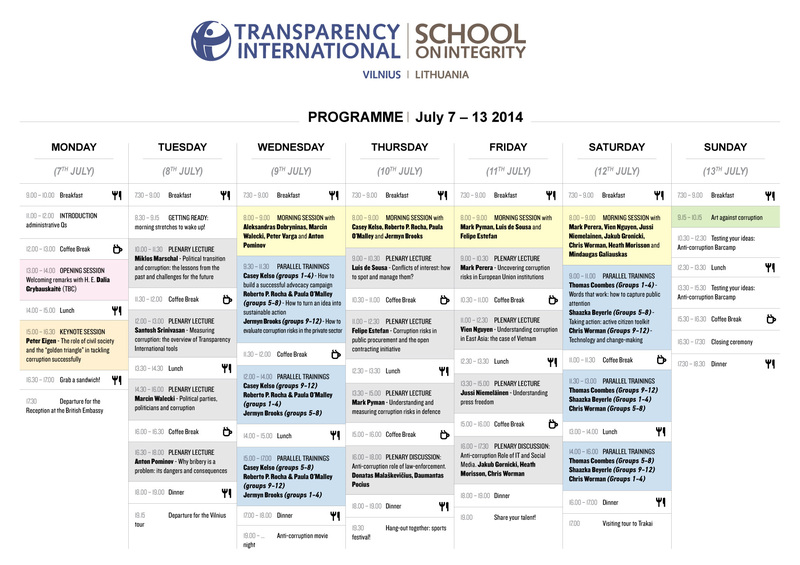 Transparency School is organized in cooperation with Mykolas Romeris Law School. Upon completion of the course, the students receive 6 ECTS (European Credit Transfer System) credits. 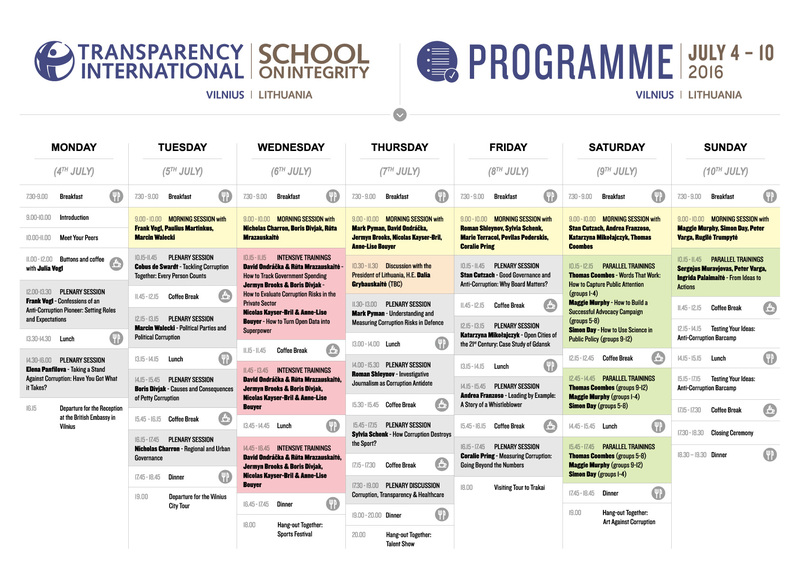 In addition, please find more information on the previous editions of the Transparency School here: 2017 | 2016 | 2015 | 2014 | 2013 and the course material below. The Convention introduces a comprehensive set of standards, measures and rules that all countries can apply in order to strengthen their legal and regulatory regimes to fight corruption. It calls for preventative measures and the criminalization of the most prevalent forms of corruption in both public and private sectors, and requires Members States to return assets obtained through corruption to the country from which they were stolen. 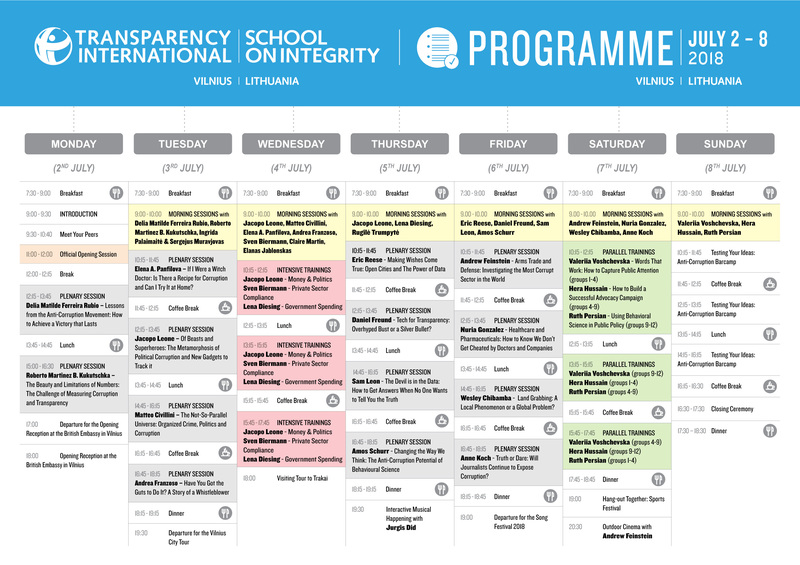 The Anti-Corruption Plain Language Guide, developed by Transparency International, offers a set of standardised, easy-to-understand definitions, providing readers with concrete examples in practice of how TI approaches these issues. 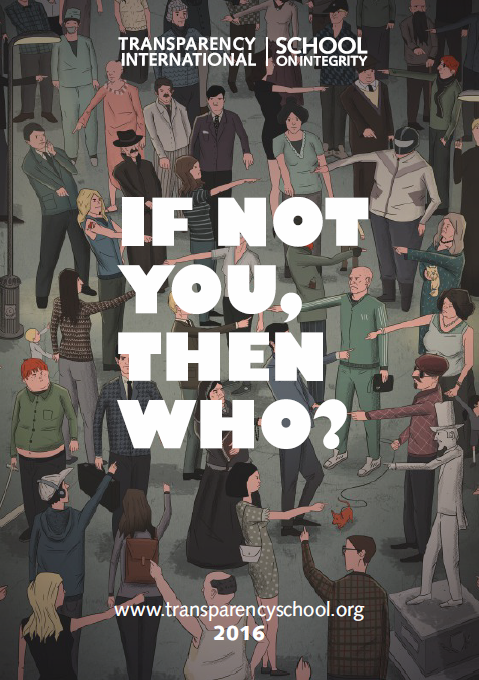 It aims to provide clarity on the terms that the anti-corruption movement uses most in its daily work as well as those associated with new and emerging issues. Relevant links are also provided for further backrgound information and research. The Corruption Perceptions Index ranks countries and territories based on how corrupt their public sector is perceived to be. A country or territory’s score indicates the perceived level of public sector corruption on a scale of 0 – 100, where 0 means that a country is perceived as highly corrupt and 100 means it is perceived as very clean. A country’s rank indicates its position relative to the other countries and territories included in the index. This year’s index includes 177 countries and territories. 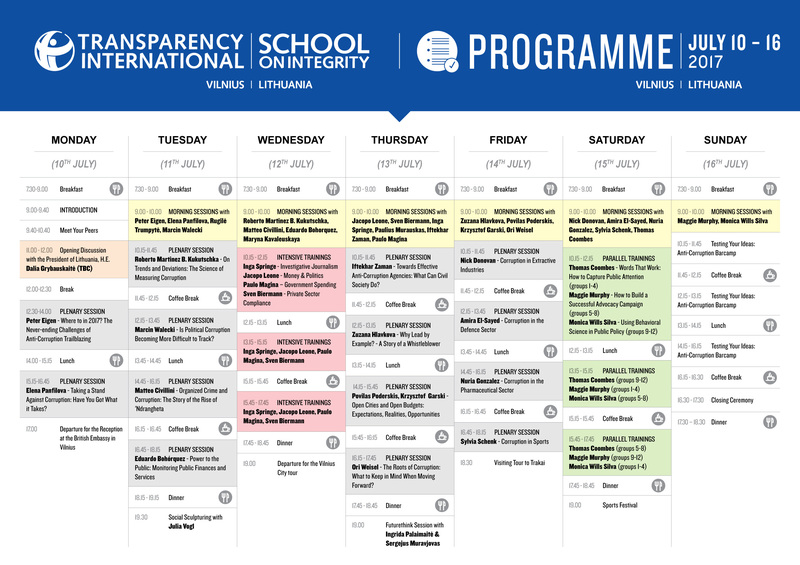 The Transparency International Global Corruption Barometer is the largest cross-country survey collecting the views on and experiences of corruption of the general public . In 2010 and 2011, the Barometer interviewed more than 100’000 people in 100 countries, making it the most comprehensive round since the survey was launched in 2003. The Barometer explores the general public’s views about corruption levels in their country as well as their government’s efforts to fight corruption. The 2010/11 Barometer also probes the frequency of bribery, reasons for paying bribes in the past year and the attitudes towards the reporting of corruption incidents. The Bribe Payers Index is a unique tool capturing the supply side of international bribery, specifically focusing on bribes paid by the private sector. It asks senior business executives in a number of countries around the world for their perceptions of the likelihood of companies, from countries they have business dealings with, to engage in bribery when doing business in the executive’s country. Data for the Index is drawn from the Bribe Payers Survey – a country’s score is an average of the scores given by all the respondents who rated rated the country, resting on a 0-10 scale. A score of 0 corresponds with the perception that companies of that particular country always pay bribes when doing business abroad; a score of 10 indicates a perception that they never pay bribes in their ventures abroad. The Global Corruption Report (GCR) is one of Transparency International’s flagship publications, bringing the expertise of the anti-corruption movement to bear on a specific corruption issue. The report highlights cutting edge qualitative and quantitative research, gathers knowledge on lessons learned and showcases innovative tools. In doing so, it enhances our understanding of the dynamics of corruption and seeks to provide practical and proven solutions to improve governance and accountability. 7. OECD Convention on Combating Bribery of Foreign Public Officials in International Business Transactions: The OECD Anti-Bribery Convention establishes legally binding standards to criminalise bribery of foreign public officials in international business transactions and provides for a host of related measures that make this effective. 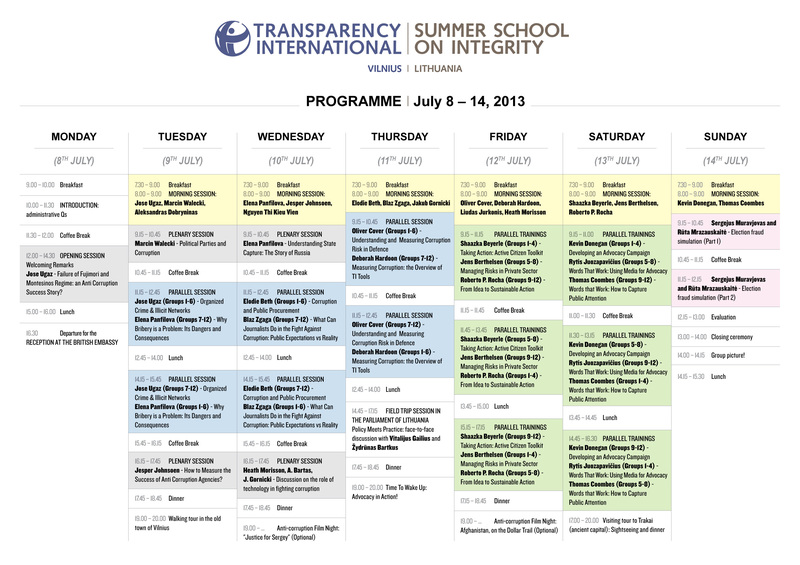 It is the first and only international anti-corruption instrument focused on the ‘supply side’ of the bribery transaction. The 34 OECD member countries and six non-member countries – Argentina, Brazil, Bulgaria, Colombia, Russia, and South Africa – have adopted this Convention. The UN Global Compact asks companies to embrace, support and enact, within their sphere of influence, a set of core values in the areas of human rights, labour standards, the environment and anti-corruption. Its ten principles in these areas enjoy universal consensus and are derived from major international treaties and agreements. The Civil Law Convention on Corruption, adopted by the Council of Europe on 4 November 1999, requires Member States to take measures at national level to provide for effective remedies for persons who have suffered damage as a result of acts of corruption, to enable them to defend their rights and interests, including the possibility of obtaining compensation for damage. The Convention contains provisions for international co-operation and monitoring action to ensure the aims above are met. The Criminal Law Convention on Corruption, adopted by the Council of Europe on 27 January 1999, requires Member States to take measures at the national level to criminalize and punish the conduct of bribery, trading in influence, money laundering (of proceeds from corruption offences) and all related account offences. Due to the nature of the Convention, it contains further provisions for international co-operation and compliance to ensure effective enforcement across borders. It is notable that the Convention contains provisions for holding legal persons accountable in certain cases for the criminal offences listed above committed by natural persons occupying leading positions in those legal entities. The Convention also requires Member States to enact provisions for the protection of witnesses to these acts and collaborators of justice (known colloquially as “whistleblowers”).